A few here...which one is the healthiest? Read on. The Frozen Yoghurt (or Fro-Yo) revolution has well and truly come alive in Sydney. Every time we blink our eyes, it feels like another fro-yo establishment has opened up right in front of our eyes. Yes another Moochi, or another Yogurberry for instance. People are catching onto the fro-yo revolution that came onto Sydney's shores from the good United States of America in a cool way, speaking of which, not only does this food cool us down, it is also good for us. Think healthy bacteria. People lining up in good health. Love it. Therefore, where can the healthiest fro-yo be found? 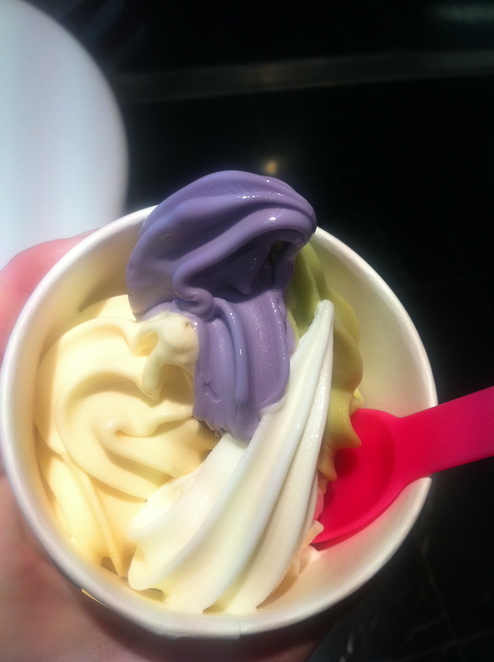 Yogurt World at Westfield Sydney are quite innovative when it comes to fro-yo flavours. 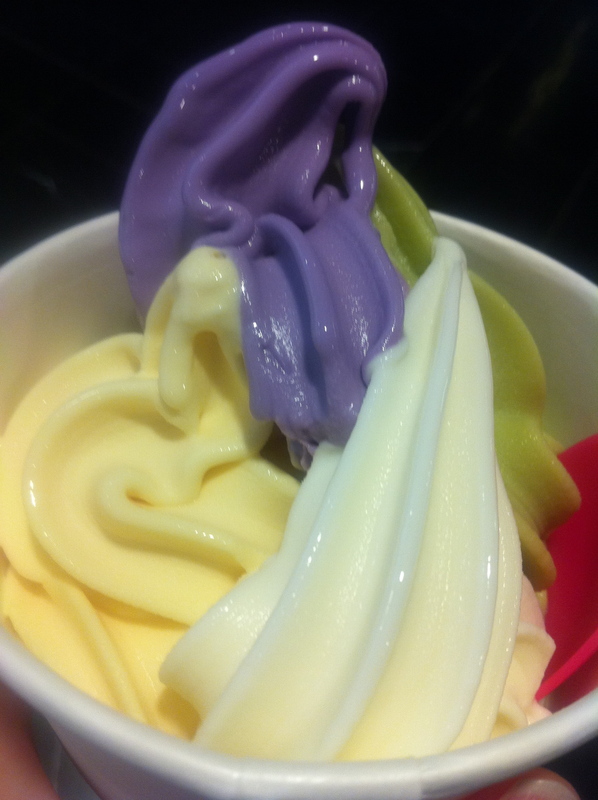 Think Taro, Green Tea, Lychee, Chai and even Honey yoghurt. Way better than chocolate, c'mon. This is what the healthiest fro-yo in Sydney looks like. The winner would be the Soy Honey fro-yo at Yogurt World at Level 5 in Westfield Sydney, right next to Jones the Grocer and Priceline. From tasting it, it may appear to be a little sweet, no different to the honey taste in a banana smoothie, however your taste buds begin to get used to a fro-yo flavour that is really, really good for you. For starters, this fro-yo flavour at Yogurt World contains pure manuka honey, is 98% fat free and has a low GI count. This is great. Furthermore, through further research, this soy honey yoghurt is also gluten free, dairy free and actually contains good protein absorption, and is not genetically modified as many soy milk products can be, especially as no dairy is involved. The healthiest fro-yo self serve style. 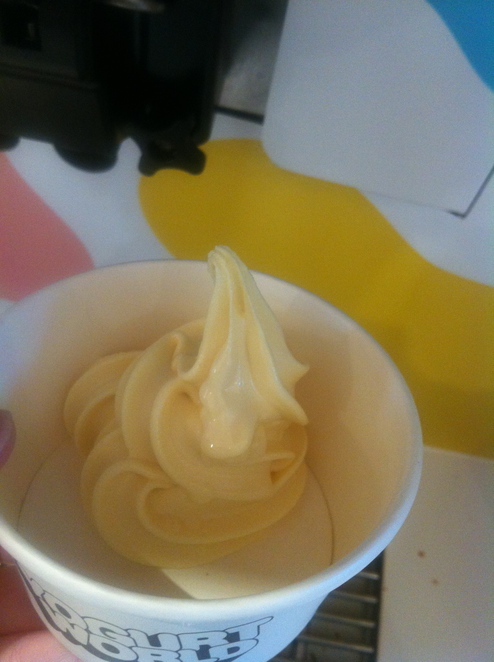 Back to why the Soy Honey yoghurt is voted the healthiest fro-yo in Sydney. Apart from these other attributes that scream healthy as indicated above, you're also getting your probiotics into you in preserving the good bacteria our bodies need. Additionally, this fro-yo self serve treat also contains no preservatives, artificial colours or flavours. That tick of approval, yes. Who would have thought that eating a take away fro-yo could be that healthy without compromising on taste? Pretty cool. The best of fro-yo health on the left hand side. What do you think? Where have you found Sydney's healthiest fro-yo? Love to read what you have to say on this healthy fro-yo trend, something else of which could easily be a revolution in itself.